Pulsating Sprinkler Part Circle 1/2"IRO-803 with one Nozzle. 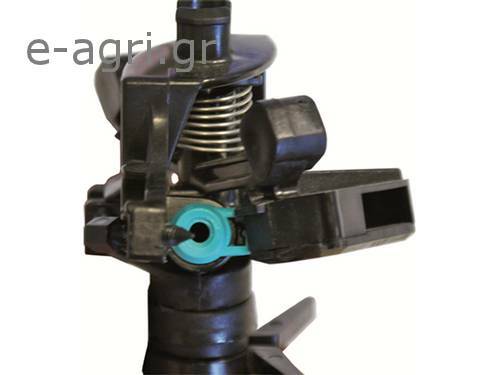 • Riser-mounted impact sprinkler for gardening, horticulture, Public and private gardens., agricult ure, floriculture and greenhouses. • Horticultural plantations, floriculture and fruit trees. • Made of plastic and stainless steel. • Arm with anti-splash design. 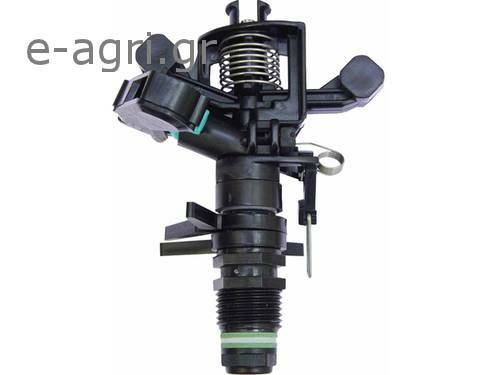 • Sprinkler height: 13 cm. • Spring tension regulation system. • Irrigation area system controlled by rotating clips. • Adjustable jet breaker diffuser pin.or 70 cm stake. • Its versatility and adaptability to all typesof garde. Special design ns make thiswith a threaded shaft for fitting to model one of most common for homegardening. • Range distance: 10 - 13 m.
• Working pressure: 1.5 - 4 bar. • Area: Full or part circle. • Maximum stream height: 2,5 m.
• Rotation time: Adjustable. Depending on the pressure and thenozzles, the rotation will be constant and continuous. • Uniformity coefficient higher than 90% in areas of 10x10R,12x12T, 12x13T.